The history of basketball began with its invention in 1891 in Springfield, Massachusetts by Canadian physical education instructor James Naismith. It was created as a less injury-prone sport than football. The game became established fairly quickly and grew very popular as the 20th century progressed, first in America and then throughout the world. After basketball became established in American colleges, the professional game followed. 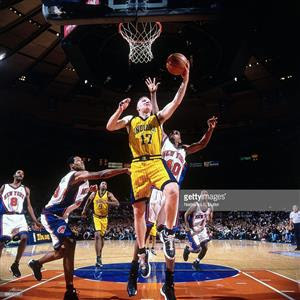 The American National Basketball Association (NBA), established in 1946, grew to a multibillion-dollar enterprise by the end of the century, and basketball became an integral part of American culture. Sidelines: The lines on the sides of the court, running the length of the court from one side to the other. Baselines: The lines on the ends of the court, running the width of the court from one side to the other. Free-throw line: The line at the top of the "key" or three second area, where free-throws are taken. Half-court line: The line in the center of the court that separates one side of the court from the other. Three point line: The arched line on each side of the court where if you shoot from behind this line you score three points. Dribbling is the way that one player can move the basketball down the court. He/she is to bounce the ball repeatedly without holding onto it, dribbling with two hands at once, or stopping and restarting. 1. The athlete is keeping the ball below their waist and not dribbling very high. 2. The athlete is bent at the waist, leaning over in an athletic stance. 3. The athlete is using their non-dribbling arm to protect the ball from a defender. 4. The athlete's head is up and their eyes are not looking directly at the basketball. Shooting a basketball is the action of attempting to score by throwing the basketball into the hoop. This includes lay-ups, free-throws, and three-point shots. The first image shows the proper shooting form. 1. The ball is resting in the dominant hand, while the other hand acts as a guide. 2. The elbow is band above the shoulder with the ball being held slightly above the head. 1. The arm straightens and the wrist snaps in the direction of the basket. 2. The guiding hand stays off to the side having already done its job. 3. The athlete keeps their eyes on the basket at all times. The third image shows the proper form for a lay-up. 1. You shoot with one hand above your head while jumping off of one foot. If you are shooting with your left hand, you jump off of your right foot. If you shoot with your right hand you jump off of your left foot. 2. A jump shot uses both feet to shoot while a lay-up only uses one foot. 3. The opposite hand can be used to protect your body and arm against defenders. 4. The ball is brought from a dribble to both hands where it is then extended above the head and released using only one hand. 1. Traveling - Moving while holding onto the basketball and not dribbling. Also taking more than two steps without dribbling. 2. 3-second - Staying inside the 3-second area, or the "key" while you are on offense without leaving. You may leave and then return, but you may not simply stay inside the 3-second area the entire time you are on offense without leaving. 3. 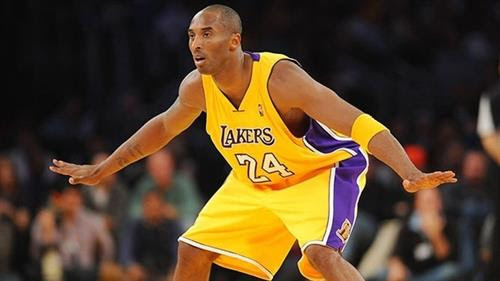 Carrying - While dribbling you place your palm under the ball, take a step or two, and then start to dribble again. 4. Backcourt - While you are on offense once the ball passes the half-court line you may not return to the other side of the court. 5. Double dribble - Once you stop dribbling and pick up the basketball, you are not allowed to dribble again. You must either shoot or pass once you stop dribbling. You cannot dribble for 3 seconds, stop and pick up the basketball with two hands, then continue to dribble again. 6. Kicking - If you kick the basketball then the other team gets the ball out of bounds at the closest spot to the foul. 1. The ball is held at chest height. 2. 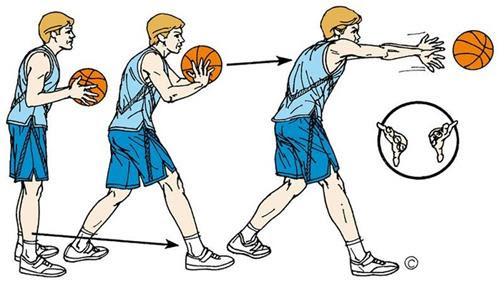 The athlete places their thumbs behind the basketball and begins to step forward. 3. The athlete extends their arms and pushes the ball out while pointing their thumbs down. 4. Stepping forward, or in the direction of the pass, helps give more power and accuracy. 1. The ball is held overhead. 2. The athlete steps forward and releases the ball above their head. 3. The ball typically arrives at your teammate above their head as well. 1. In a half-court game there are typically three athletes on each team. It is played 3 on 3. If a student is absent then you can play 2 on 2. 2. Full-court basketball is played 5 on 5. 3. If the ball goes out of bounds it is the other team's ball where it went out of bounds. 4. If a team commits a violation then the other team's ball at the closest spot out of bounds that the violation occurred. 5. Any disagreements that cannot be settled immediately by the players involved is to be solved by a "Rock-paper-scissors" game. 6. If the offense calls a foul, the defense must agree to this call. It is up to the players involved to be honest when calling their own fouls. 7. All baskets count as 2 points. 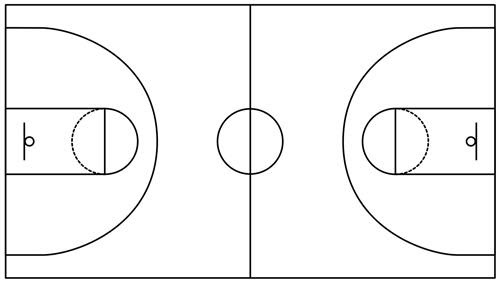 Most courts do not have a 3-point line so therefore all baskets scored equal two points. 8. After a foul or violation the team that has possession of the ball must "check" the ball with the other team. They will pass the ball to a member of the opposite team who will check that their team is ready. When they are ready they will pass the ball back and play can resume. 9. 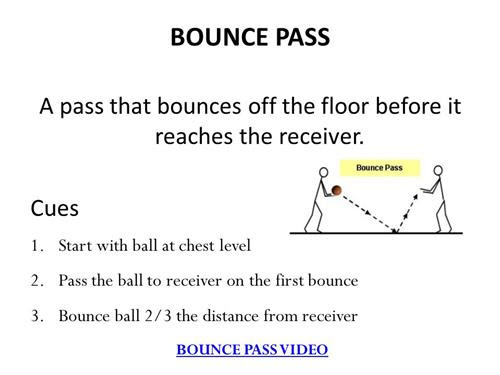 In a half-court game the ball must be "cleared". This means that if a team misses a shot and the opposite team gets possession of it, they must either pass or dribble the ball past the free-throw line in order to shoot it. 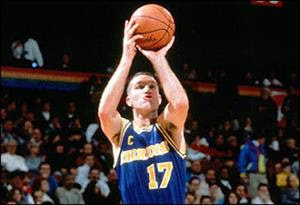 If a member of the same team gets a rebound then they can shoot again and do not have to clear the ball. 10. A rebound is when an athletes grabs a missed shot. 1. Point guard - This player is typically very good at dribbling and passing the basketball. They can also be quick and able to run around the defense quickly. 2. Shooting guard - This player is typically the best shooter on the team. They can play good defense and also shoot the ball very well from most spots on the court. 3. Small forward - This player is typically good at defense, not as short as a point guard, but not as tall as a center. They can also be very good at offense. 4. 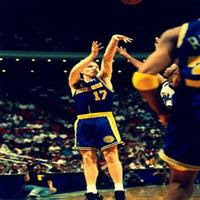 Power forward - This player is typically shorter than a center but very good at rebounding and playing defense. They are powerful. 5. Center - This player is typically the tallest player on the team. They can rebound very well and are the center of any zone defense. This is your basic defensive position. 1. The defender should have their arms out to the side. 2. The defender should have their feet wider than their shoulders and their knees bent. 3. The defender should bend their knees and lean over slightly from the waist. 4. The defender should keep their eyes on the person they are guarding. Man-to-man defense - This defense is where each person on a team will defend a single person on the other team. Their job is to prevent them from scoring or rebounding the basketball. Zone defense - This defense is where each person will defend an area on the basketball court. They will defend players that come into their area and then let them leave their area so that another player can defend them whenever they leave.